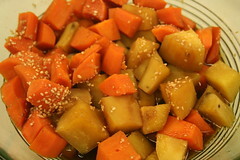 Today, we prepared sweet potato Japanese-style in soy sauce and mirin, a sweet rice cooking wine. For color, we used two kinds of sweet potato – a yellow variety that looked like potatoes, and an orange variety that looked like carrots. Today, we prepared a North African-inspired summer squash dish with patti pan, yellow straightneck, and yellow crookneck squash and, zucchini, accompanied by chickpeas and middle eastern couscous (a larger version of the more common small grain couscous). 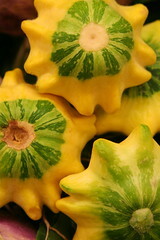 The dish was spiced with turmeric, cayenne pepper, coriander, cloves, cinnamon, and black pepper. We also prepared a Japanese-inspired salad with blanched green, yellow, and purple beans seasoned with mirin, miso, honey, and toasted sesame seeds. In preparation for these dishes, we also prepared vegetable broth, chickpeas, and couscous. We sautéed the couscous in butter to bring out its flavors and develop an appetizing brown hue before adding the vegetable broth.